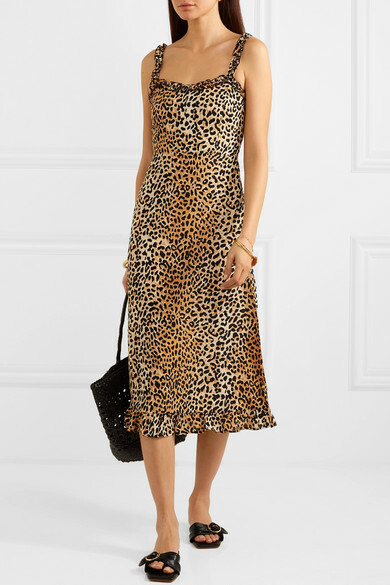 Perfect for balmy days in the city or on vacation, Faithfull The Brand's 'Noemie' dress is made from crepe and hand-dyed in the label's own unique leopard-print. It's traced with ruffles along the sweetheart neckline, shoulder straps and hem and turns to reveal an elasticated shirred back. Wear yours to dinner with mules and a bold red lip. Shown here with: Dragon Diffusion Tote, Nanushka Sandals, Sophie Buhai Bangle, Sophie Buhai Earrings, Alighieri Bracelet.